I broke down and ordered the Zig Clean Color Brush Markers. I had to. I kept seeing so many wonderful projects and excitement over them, I just had to do it. So I did! Que the angels singing, bright lights.... I LOVE THEM! A couple of pointers. Use Bristol paper. I tried traditional watercolor paper by Canson my first time experimenting and I could not get the colors to move like I had seen everyone else doing. The paper makes all the difference. Be sure and dry your stamped image before you begin to color. Yes, I know you seasoned stampers are probably keenly aware of that little fact, but I was not. My last bit of advise.... PLAY! this is so fun! 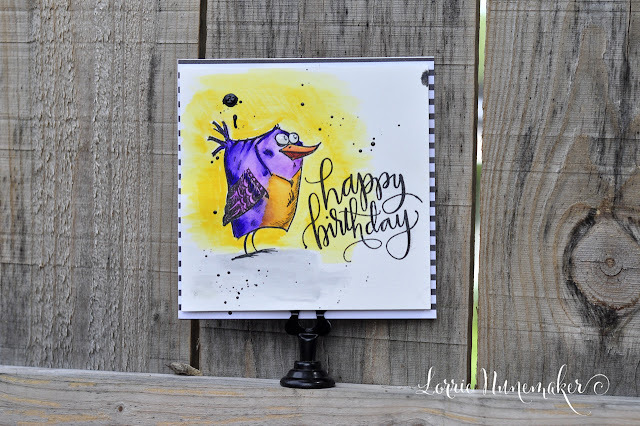 The Tim Holtz bird crazy stamps are so much fun to color! When I first laid eyes on this set, I thought they were strange birds, but the more I looked at them, the more I knew I NEEDED them. They are so incredibly adorable!